The Cuban Embassy hosted a reception in Beijing marking the 60th Anniversary of the triumph of the Cuban Revolution on January 11, drawing the participation of hundreds of guests including government officials, diplomats, entrepreneurs, media and friendly groups. 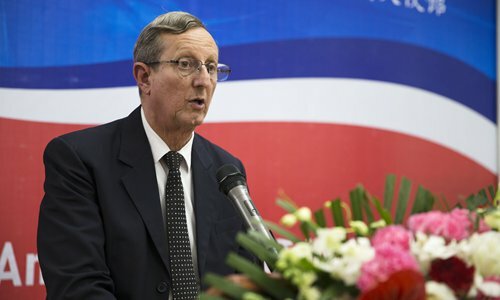 The Cuban Ambassador to China Miguel Ángel Ramírez Ramos gave an opening speech in which he reviewed the historical milestone and the past achievements since the Cuban Revolution and gave a positive perspective for the future. "The Revolution has not ceased in its endeavor to build an equal and fair society," the ambassador said. "The achievements in public health and education, both free of charge, and the culture, the sports, the ecological preservation, the tourism and the bio-pharmaceutical industry are significant," he said. Next year will be the 60th anniversary of the diplomatic relations between China and Cuba. Ramírez Ramos said that in 1960, more than a million of Cubans, led by former Commander in Chief Fidel Castro decided to establish diplomatic relations with China, becoming the first country in the western hemisphere to do so. "Since then, we have maintained friendly, brotherly and mutual support ties, which have been strengthened through time," he said. Hao Mingjin, vice chairperson of the Standing Committee of the National People's Congress, also attended the event.